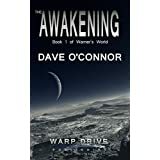 This is a shameless plug for our very own Dave 'Arjuna' O'Connor new book, The Awakening, now available for sale on Amazon. Dave Warner is the right person at the right place at the right time. He just doesn't know it yet. It's 2512 and he's had no time to grieve for his wife and children killed in the first nuclear strike of a civil war between the Federation and Alliance. He commands the Federation frigate, Hermes, and is deep in enemy space on a mission to rescue his best friend who has vital intelligence about the start of the war. Trouble is they've been betrayed, ambushed and suffered losses. Now his crew are beginning to doubt his judgement. What Dave doesn't know is that he's about to go on a roller coaster ride of events that will give him a new chance at love and transform him from the spiritual warrior into the reluctant hero. Humanity is about to get a new legend. Discussion in 'Command Ops Series' started by Dave 'Arjuna' O'Connor, Sep 11, 2015. Congratulations .. I am amazed… you are a bloke with many talents . Must confess I have not read a fiction book, apart from Le Carre books for decades and them not for a decade or so.... but good luck with it.. am sure you will do well with it.. seem to able to turn your hand anything effortlessly.. So I bought it on amazon.de (where it is available, amazon.nl doesn't sell it, amazon.com doesn't deliver to customers in NL). I want to read it on my Windows Phone. There is a kindle app for windows phone, but it can only connect to amazon.com, where it isn't in my account. The browser reader works on my PC (so the good news is I already read chapter 1, and I like the pace), but I only bought it because it is you, but otherwise I refuse to buy from Amazon, just because of this limited and lock-in platform format of them. I wish I could purchase just from you and bypass the big bad monopolists. Deze titel is niet verkrijgbaar voor je land. "Deze titel is niet verkrijgbaar voor je land." means "This title is not available for your country"
I hear you Erik. Originally I wanted to go the traditional publishing route but despite my best efforts I could not get a single agent interested. Only one agent actually bothered to request a copy of the book and then said several months later that it wasn't a good fit for them. So in the end self publishing was the only option to get it out there and Amazon is the least cost option for me to self publish. Hopefully if I can prove it's worthy I'll get approached by a publisher and then we can get it out to traditional outlets. But in the meantime I am tied to Amazon I'm afraid. Don't read fiction any more but good luck anyway . Cutting out the middleman is the future , nice one Dave . I will buy it, Dave! Good luck! Just bought it. Good price!! Seems to be selling really well. 31,000 from top rank. That's superb (believe me, it is! - my own latest book - published by the UK's third largest publisher just a couple of months ago, is already languishing around the 260million rank, or some such....). Fingers crossed. The main reason for that mark is because I had the book on pre-order for a month and so all the pre-orders got transacted on day 1 of the release. Hence for one day it looks like you have great sales. The proof will be in the next few weeks. I'm impressed by what I've seen so far. I just started playing Homeward Remastered this weekend, and this seems right down that alley. My reading backlog is a bit piled up right now, but I have a vacation coming up that should help alleviate some of that. I've seen enough to give book 1 a try. I know Dave won't ask this but I will. Dave has work with me for over 8 years. As a teenager I loved Dave's board games including Trial of Strength and his first Mac game. So anyone that buys his book please make sure to leave a review on what you think of the book. I am off to now buy a copy. Finally got to read it on vacation, and I liked it a lot. Review is up on Amazon, and I'm really looking forward to book 2. Already have it pre-ordered. As a side note, it would be great if Dave got together with an artist so make some illustrations of the ships, weapons and gear used in the books. Yeah I agree it would be a cool addition. But I don't think my artistic skills are good enough. If there are any artistic souls out there who would like to help out I'd love to hear from you. That would be nice. Would need a some significant funding though. BTW Redemption, book 2 of Warner's World, was released a week ago on Amazon. Dave Warner is in pursuit of the Sleth. His mission is to seek peace if he can, war if he must. But his beloved Rihan Kabel is in harm's way and his best friend, Art Simons, has his own agenda to rescue his fiancé, Sue Chalker, no matter what it takes. Love, loyalty and duty collide. Something's got to give. Someone must pay the price. When humanity faces new revelations and challenges is there time for love and personal redemption.